Robert N. Essick, The Works of William Blake in the Huntington Collections: A Complete Catalogue, reviewed by G. E. Bentley, Jr.
MARK ABLEY is a journalist in Montreal and the editor of The Parting Light: Selected Writings of Samuel Palmer (1985). STEPHEN C. BEHRENDT, Professor of English at the University of Nebraska, is the author of The Moment of Explosion: Blake and the Illustration of Milton (1983). He has recently completed a study of Shelley and his audiences. His poetry is widely published. G. E. BENTLEY, JR., University of Toronto, is publishing Blake Records Supplement (Oxford University Press, perhaps 1987), as well as works on Richard and James Edwards, Thomas Macklin, and George Cumberland. MARK BRACHER, Assistant Professor of English and Associate Director of the Center for Literature and Psychoanalysis at Kent State University, is the author of Being Form’d: Thinking through Blake’s Milton (1985) and coeditor of Critical Paths: Blake and the Argument of Method (1987). He is writing a psychoanalytic study of Blake’s early prophecies. LESLIE BRISMAN is Professor of English at Yale University. His next book is The Voice of Jacob: A Midrash on Genesis. 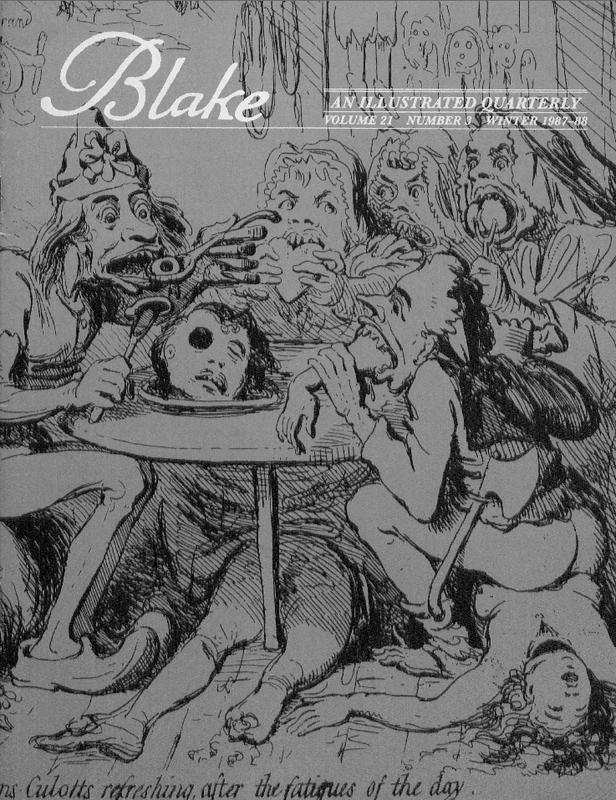 ROBERT F. GLECKNER, Professor of English and Director of Graduate Studies in English at Duke University, is author of The Piper and the Bard, Blake’s Prelude: Poetical Sketches, and Blake and Spenser. He is currently working on a monograph study of The Marriage of Heaven and Hell. DAN MILLER teaches literature and literary theory at North Carolina State University and is coeditor (with Mark Bracher and Donald Ault) of Critical Paths: Blake and the Argument of Method (forthcoming, Duke University Press). MICHAEL SCRIVENER, Associate Professor of English at Wayne State University, is the author of Radical Shelley (1982) and various articles and reviews on the English Romantics. He is presently researching the poetry and literary assumptions of English radicalism from the 1790s to the Chartist period.